The story behind the publication of this book – more than half a century after it was written – is nearly as enthralling as the subjects it canvasses. 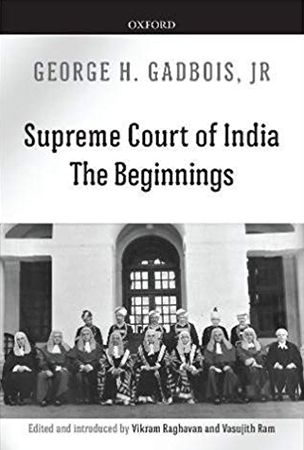 Professor George Gadbois previously published Judges of the Supreme Court of India: 1950-1989 (Oxford University Press, 2011) and taught political science at the University of Kentucky for nearly all of his academic career. He passed away in 2017 at the age of 80. His preface and the book itself are dated April, 1965, but the book’s introduction by Vikram Raghavan and Vasujith Ram is contemporary. In it, they explain the book’s origins. When Gadbois first arrived in India in the 1960s, he was “a young, blonde-haired American with tortoise-shell glasses…” He spent several years in the subcontinent, including a year in Delhi at the colonnaded and sandstone-dressed Supreme Court of India, where he researched material for his doctoral dissertation, a dissertation which he completed in 1965 and titled The Paramount Judiciary in India: 1937-1964. More than fifty years later, the dissertation would be re-titled, edited, and published as this book. In his dissertation, Gadbois deftly explored chronology and legal doctrine as well as political debates, the role of judicial review, and the context of a modern democratic welfare state in India. Gadbois grew up “in a hardscrabble Boston suburb” delivering newspapers and shoveling snow. After three years in the U.S. Army, serving in Taiwan where he helped monitor Chinese aircraft on the mainland, he pursued a college degree. First, he received a bachelor’s degree from a small liberal arts college in Ohio. Then he went on to Duke University in North Carolina for his master’s and doctoral degrees. After joining the University of Kentucky’s political science department, he undertook research on the Indian judiciary and thirty-six judges appointed between 1950 and 1967. From there he pursued an empirical analysis of Supreme Court decisions. By the 1980s, he turned again to judicial biographies of Indian judges. He travelled across India again, interviewing retired judges. Eventually, this work became his Judges of the Supreme Court of India book which studies the Supreme Court’s first ninety-three judges. The book was well received. The favorable reception motivated Gadbois to revive his research interests and return to India. But in 2015, he was diagnosed with a serious illness. Calmly, he began settling his affairs. Vikram Raghavan and Vasujith Ram visited Gadbois in Kentucky and noticed the bound 1965 doctoral dissertation on his desk. With some cajoling, they convinced him that it should see publication. Sadly, Gadbois’ deteriorating health prevented him from participating in much of the editing, except to rename his Ph.D. dissertation Supreme Court of India: The Beginnings. It was finally published – posthumously – in 2018. Between the covers of this new book, Gadbois sketches the creation of the Federal Court with its limited jurisdiction by an act of Parliament in 1935. Previously, final appeals had to be heard by the Judicial Committee of the Privy Council, which was respected, but faraway in London and lacking a command of Hindu and Muhammadan law. The Federal Court convened for the first time in late 1937. Until independence, its Chief Justice would always be English with two colleagues, one Muslim, and one Hindu. In 1942, it issued a landmark ruling and released thousands of political activists who had been detained during wartime. Other anti-government decisions would follow, but the Privy Council still remained the final appellate body and overruled many of them until the Indian Constitution came into force in 1950. The Constitution’s authors were influenced by the basic framework of the Federal Court as they designed the Supreme Court. Twenty-four articles were devoted to the Court and its sweeping powers and jurisdiction including an express grant of judicial review authority. The methodology for judicial appointments was actively debated, Gadbois reports. The various constitutional bases of the Supreme Court’s jurisdiction are also carefully explicated. The framers wished to model the Supreme Court somewhat after the United States Supreme Court, but were wary about investing the justices with too much power. The framers were well aware of the U.S. Supreme Court’s thwarting of majoritarian aims when the social re-engineering attempts by Franklin Delano Roosevelt’s administration were repeatedly cast aside as unconstitutional. They did not wish to see their Parliament face that sort of drubbing. But in the end, the Indian Supreme Court would invalidate legislative acts, to the chagrin of Jawaharlal Nehru’s government. The highlight of the book is a survey of constitutional questions with which the Supreme Court wrestled in the 1950s and 1960s. Gadbois concentrates in particular on a series of eminent domain cases arising out of Article 31 of the Constitution. The case of Dwarkadas Shrinivas of Bombay v. The Sholapur Spinning and Weaving Co. Ltd., and Others, for example, involved what American jurists would call a “regulatory taking.” In fact, the Indian Supreme Court cited to American Justice Oliver Wendell Holmes’ opinion in Pennsylvania Coal Co. v. Mahon several times, drawing a distinction between an ordinary regulation and one which goes so far as to amount to a taking (thereby requiring the government to pay compensation to the owner and making some forms of social engineering cost-prohibitive). The facts of the Sholapur Spinning and Weaving case involved a large textile mill which had closed as a result of financial difficulties, leaving thirteen thousand workers unemployed. When the government determined that mismanagement had caused the closure, it enacted legislation which permitted it to take over the mill and correct the company’s missteps. The legislation allowed the government to suspend any liquidation of assets, remove and appoint members of the board of directors, and ignore shareholder resolutions. Some shareholders brought suit, losing in the Bombay High Court, but succeeding before the Supreme Court. Although the shareholders had not been dispossessed of all their property rights, the deprivations they had suffered were so substantial as to amount to a taking of their shares, the court reasoned. And since the legislation did not provide for compensation to the shareholders, it was deemed unconstitutional. In response to this and other decisions, Prime Minister Nehru introduced and guided through Parliament a constitutional amendment. (Other amendments had preceded it as well; the framers allowed for a relatively effortless amendment process with the consequence of a back-and-forth tussle between the legislative and judicial branches). The latest amendment provided that a law whereby private property is acquired by the government “shall not be called into question on the ground that the compensation provided by law is not adequate.” The amendment also proclaimed that so long as legislation does not require the transfer of property to the state, it may not be deemed a taking of property, even when the owner is deprived of it. The amendment became effective in 1955. “As a result,” Gadbois concludes, “the scope of judicial review over legislation affecting private property was so diminished as to be hardly worthy of mention.” Still, other land reform legislation would invite further judicial scrutiny in the years to come for other reasons. Supreme Court of India is more than simply a period piece. Gadbois’ prose is clear and crisp, his ideas accessible. He was a young scholar when the book was first written. Still, the book has a maturity about it. Gadbois does more than simply report events; he applies a balanced and compelling analysis to the law, the role of courts, and social context. Vikram Raghavan and Vasujith Ram must be thanked for helping make this exciting and readable book available to a wider audience. Thomas E. Simmons is an associate professor at the University of South Dakota School of Law. He can be reached at tom.e.simmons@usd.edu.